Collecting pottery is a unique hobby, whether collecting Italian, Mexican pottery or clay, terracotta, ceramic decorative pots which just tickle your fancy, pottery designs can add an extra flare and personality to your indoor and backyard landscaping ideas or even a xeriscape design. Modern mechanized production of pottery and planters has placed more focus on mass production and less on artistic designs. Many “specialist” hand paint and create abstract compositions or draw realistic images. Some pottery designs are not painted at all; but adding special colors and textures into the clay during production create interesting looks. 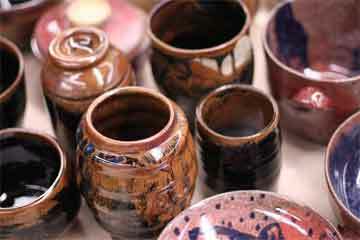 For instance, by adding different mixtures of colored clay, sand, metal oxides, carbonates and combustible particles can produce unique patterns and colors into pottery designs which hand painting simply cannot imitate. These decorative accents come in all kinds of shapes and sizes. While some resemble the traditional vase shape, others can be rounded or bubble shaped. Pottery can also be a combination of shapes leading to some truly creative designs, like turtles, lions and people even. Some take “design” a little further by creating not just pottery but designs in the form of statues and figurines of people, shape of cups, jars, plates and bowls are also popular items. Finding unique containers and pottery is not limited to shape and size. Many you find for sale come with culture attached. Nations around the world can be represented in pottery form, planters from Mexico, Nicaragua, China, Poland, the United Kingdom, Italy, and practically every country you can name. These designs from other regions of the globe are especially unique from the quality of work, culture and personality of the meticulous work to create their unique art form. How many times have we learned of cultures from the pottery discovered at a archeological dig or the been amazed at the at auction for a chinese urn? While you cannot buy prehistoric treasures off of eBay, you can download some interesting shapes for your pottery class, contemporary and cultural pottery designs online. Looking for guidance on how to start designing your own unique style of pottery? Purchase a book online and start creating your own collectible designs today.